Multiple sclerosis is a potentially crippling disease of the brain and spinal cord (central nervous system). In MS, the immune system attacks the protective sheath (myelin) that covers nerve fibers and causes communication problems between your brain and the rest of your body. Eventually, the disease can cause the nerves themselves to degenerate or become permanently impaired. Signs and symptoms of MS differ from person to person and depend on the extent of nerve damage and which nerves are affected. Some people with severe MS may lose the ability to walk without support or may not be able to walk at all, whereas others may experience long periods of remission without the development of any new symptoms. There is no cure for multiple sclerosis. However, treatments can help speed recovery from attacks, ameliorate the impact of the disease and manage the disease in an effective way. The aim of rehabilitation is to improve and maintain function. From the time of diagnosis onward, multiple sclerosis rehabilitation specialists provide education and treatment designed to boost good health and general well being, reduce fatigue and help you feel and function at your best, both at home and at work. If symptoms begin to interfere with everyday activities, a multiple sclerosis rehabilitation team can address issues with mobility, dressing and personal care, role performance at home and work and overall health. They also provide evaluation and treatment of speech and swallowing difficulties and problems with thinking and memory. When you have multiple sclerosis, you may have certain physical and cognitive difficulties. Multiple sclerosis rehabilitation includes physical therapy, occupational therapy, speech therapy, and cognitive retraining. MS rehabilitation therapies may help reduce these difficulties. Multiple sclerosis rehabilitation is an integral part of health care practice for people with multiple sclerosis. 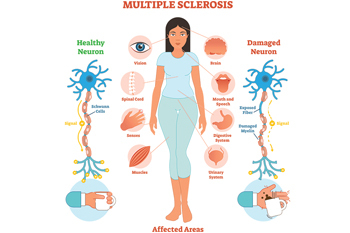 Since the majority of people are diagnosed between the ages of 20 and 50, the challenges of MS affect those at the peak of their career and childbearing years. Though MS can affect children, it is much less common in this age group. MS can lead to significant impairment including balance and coordination problems, muscle stiffness and weakness, cognitive problems, impaired speech or vision, extreme fatigue and even paralysis. Prognosis varies but the disease can cause loss of mobility and independence. Interest in multiple sclerosis rehabilitation has increased in recent years as research has shown it can lead to significant improvements in patients’ quality of life. Multiple sclerosis rehabilitation is especially beneficial because of the often progressive and unstable nature of the disease. Disease waxes and wanes, and symptoms change over time. Multiple sclerosis rehabilitation is considered a necessary element of comprehensive, quality health care for people suffering with multiple sclerosis at all stages of the disease. There is innovative research and progress occurring in terms of the potential of many types of stem cells for slowing progression of MS activity and for fixing damage of the nervous system. In light of the urgent need for more effective treatments for MS, particularly for those suffering at severe levels, the potential of all types of cell therapies must be explored. Stem cell therapy is any treatment that uses or targets stem cells, which are the types of cells that differentiate into many different specialized cells in our bodies. Stem cells are found in both embryos and adults. Many types of stem cells are being explored for their potential benefits of addressing multiple sclerosis. Stem cell therapy using bone marrow has given a new ray of hope to patients suffering from multiple sclerosis. Bone marrow is a soft spongy part of our immune system which protects us from infection and disease. It is found inside our bones, mainly in the hip bone and the breast bone. The bone marrow is where stem cells are made. Stem cells are blood cells at the earliest stage of development. All our blood cells develop from stem cells in the bone marrow. Stem cells stay inside the bone marrow and when they are fully developed they go into the bloodstream. A bone marrow or stem cell transplant replaces stem cells that are faulty or damaged with sound ones.